Companies use an SMS gateway provider to send and receive text message communications via a mobile network through CRM software, emails or a computer. This requires the use of an SMS gateway provider’s API software to send high volume text messages in the United States and world wide at bulk SMS rates. View our comparison on the leading USA SMS gateway providers below, last updated on 10th April 2019. 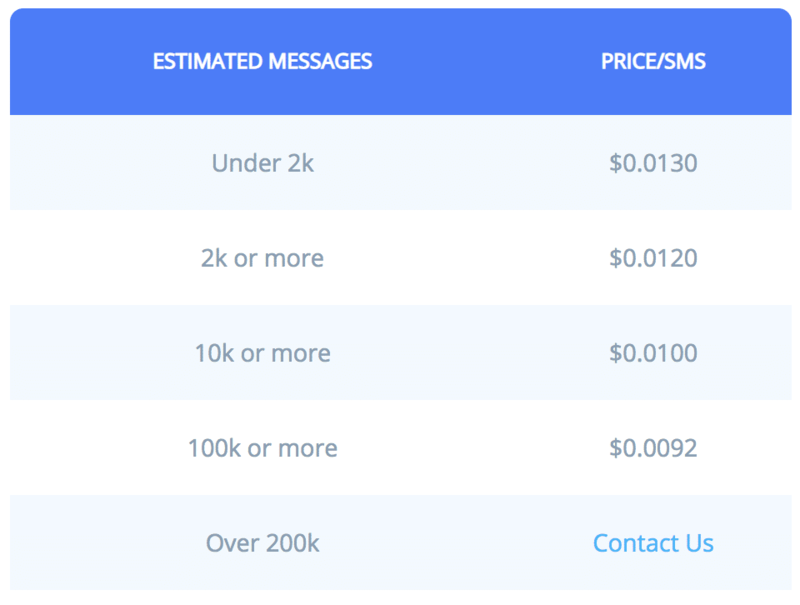 What Are ClickSend’s Mass Text Message Prices? ClickSend have exclusive pricing for businesses in the United States with the prices of outbound SMS messages shown to the right (these prices are excluding taxes). All inbound text message responses from recipients are free, therefore enabling successful two-way comunication. The only additional fee for mass text messaging services is associated with a dedicated number. This costs $5 per month with no setup fees. An American business can also decide to purchase a dedicated short code phone number for $1700 per month. ClickSend is always time efficient, with dedicated short numbers taking only minutes to set up. When comparing the prices offered by ClickSend to other leading mass text message providers and network operators, the results showed that ClickSend’s pricing is amongst the lowest costs. After analysing the pricing schedules offered by the leading SMS gateway providers in the United States, the prices vary up to 60%. This variation can be based on the network operators and service level agreements offered by the SMS provider. It can also be based on set-up fees, contract duration requirements and other additional fees. Overall, the charges offered by ClickSend are extremely competitive at most usage brackets when compared to other SMS gateway providers. This is also reinforced with large volumes of text messages where ClickSend is prepared to match any cheaper quote offered by their competitors. Of course, such cheaper pricing is based on comparable volume. ClickSend ensures that their prices are regularly checked against other SMS providers and adjusted so customers always get the best deal. Is ClickSend Suitable For Premium Text Message Requirements? While ClickSend offers the lowest prices (as proven by their price beat guarantee), they also have the best service level agreement of 100% up-time guarantee. The 100% SLA is why not only USA companies but some of the largest global companies including Uber, Siemens and Intel rely on ClickSend. They also have a high capacity network ensuring that critical time-sensitive text messages are delivered promptly. This network is why ClickSend is reviewed to be a leading text message provider for the distribution of mass text messages worldwide. What Business SMS Customer Support Does ClickSend Offer? It’s worth noting that ClickSend may appear to be a cheap ‘no frills’ provider but they have services equivalent to premium providers with a lower per unit text message cost. Their customer service personnel are highly trained professionals and will provide all the technical assistance for developers setting up their SMS campaigns or SMS API. ClickSend also provide an online messaging service to provide immediate assistance. What SMS Gateway And Mass Text Message Services Does ClickSend Offer? ClickSend is a reliable SMS gateway provider that enables efficient mass distribution of text messages to global audiences. SMS messages are sent quickly and easily with high-speed connections through direct telecommunication carriers, rather than using both direct and hybrid carrier networks. Their gateway routes are through major American carriers including Verizon and AT&T. Over 7 million text messages are able to be delivered weekly with ClickSend’s SMS gateway capacity. ClickSend states that text messages are delivered within a matter of seconds with an SMS gateway up-time of 100%. This is highly competitive compared to other leading SMS gateway providers. The web SMS option allows companies to send mass text messages from their PC with no software download requirements. All the core features to send text messages exist with individual or mass text message options available. For mass SMS campaigns, a business simply needs to upload contact lists online and a large-scale SMS broadcast can commence. This will enable mass text messages to be sent and stored either temporarily or permanently on a user’s sim card. For American businesses that have their own CRM software or messaging infrastructure, the SMS API may be the optimal solution. The SMS API integration is relatively easy, allowing firms to automate messages using the company’s existing software systems. The SMS API can be accessed using the majority of programming languages with a SDK in PHP available on their website. The email to SMS gateway through ClickSend is compatible with any email provider, including Gmail, Microsoft Live Mail, and Outlook. Using e-mail packages, SMS marketing campaigns or SMS reminders and alerts can be sent, which include free deliverability reports. No extra software is required to use this method with users just requiring to forward the message to the number in the subject line. 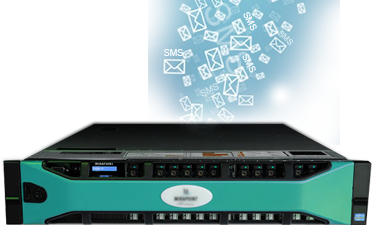 SMS gateway enables a computer, CRM, or email system to send and receive mass text messages. This is done through reliable telecommunication network operators. Communication messages are sent through USA’s leading Short Message Services (SMS) mobile networks. This enables businesses to send and receive text messages to individuals, or a large number of contacts they wish to target. Users should note that the SMS text messages have a 160 character limit. Therefore, messages exceeding this limit will be split into multiple messages, which may result in higher charges. Additionally, the speed and price of text messages sent will depend on the route taken by the USA mobile network and provider. What American Regulations Should I Consider? Identify the message was an ad. Tell recipients how to opt out of future text messages sent by you. Honour opt out requests promptly. Whilst text messages can be as long as 160 characters, research has shown that shorter, concise text messages perform the best. Thus, it is recommended that messages don’t require the recipient to scroll, as these receive the highest open rates. A mobile phone is a personal device, therefore, businesses must respect the audience’s personal space. Mass text messages that are unexpected can be intrusive and not read correctly, therefore businesses should ensure the messages are functional, yet courteous. Businesses can use customisation tools to help maximise relevance and timeliness so customer’s don’t receive text messages at inconvenient times. Whilst mass text messages are highly effective, businesses must not use bulk SMS gateways too frequently as a marketing channel. American businesses should aim for less frequent, concise messages to ensure that audiences don’t get annoyed and unsubscribe. Businesses can align their SMS marketing campaigns with other communication platforms such as emails in order to spread the message across multiple mediums. Businesses must ensure that the text message delivers useful information such as reminders, alerts, or special offers. As long as the message is sent with a legitimate purpose, audiences will want to continue to receive them in the future. The resellers SMS process has become a popular way for “resellers” to purchase text message credit from bulk SMS providers which they then resell to their customers in smaller batches. Bulk SMS gateway providers such as ClickSend provide specific resellers SMS plans. Premium direct gateway carriers enable businesses of any size to send text messages to customers, staff members and stakeholders. Messages will be sent directly to the leading US text message service providers. A text message gateway enables a computer to distribute and accept text message transmissions to and from a telecommunications network. Most text messages are routed into the mobile phone networks. ClickSend is an SMS gateway provider which uses a direct carrier. What Is An SMPP Gateway? SMPP gateway (Short Message Peer to Peer Protocol) is widely used within the telecommunications industry. It exchanges text message services between Short Messaging Entities (ESME) or Short Message Service Centers (SMSC). A level-7 TCP/IP protocol guarantees fast and efficient SMS message delivery. The SMPP can send and receive text messages from mobiles, including CDMA, UTMTS, GMA and UMTS phones. How Can An American Business Integrate An SMS API? Utilising an API is common for businesses in the United States that have large-scale communication requirements. Developers can connect to the SMS gateway through their preferred API from SMPP, Java, .NET, PHP or SOAP. Most providers will support SDKs through documents, sample cost, and reusable libraries. Businesses must ensure they choose a provider that encompasses support levels that match their understanding of the SMS API. Some businesses may need more of a hands-on approach. When setting up an API, the mass text message provider will supply a sample code. This will allow a business to connect to a SOAP API regardless of SMS API language preferred. A provider like MessageMedia has samples including o Java, GitHub in C3, Bash & Python, and PHP. Other languages such as Powershell, C++, and Ruby can also be utilised. When opting for a provider, businesses should ensure they talk to their support team and specialist SMS API technical support team of further information. What Are The Benefits Of An SMS API Integration To A Text Message Platform? Two-Way Messaging: The ability to send and receive text message to and from American SMS networks. Message Tagging: A two-way mass text message feature that reports on the application that an outbound message reply corresponds to. Delivery Reporting: Ability to track the text message’s exact time it is received by a mobile, providing businesses with a full delivery audit-trail. Validity Period: Ability to specify how long a text message should be valid for. After this specified time, if an SMS has not been delivered it doesn’t get delivered, thus saving businesses money on invalid mobile numbers. API Web Push: Real-time delivery of inbound text messages to a URL for quick replies of staff and customers. What is API SMS Gateway? An API allows simple query parameters via URLs that provide SMS gateway instructions to send text messages. This can be enabled through scripting language such as PHP that can be integrated to web forms and other applications. SMS is abbreviated for Short Message Service. It’s a communication method that allows mobile phones to communicate with each other. 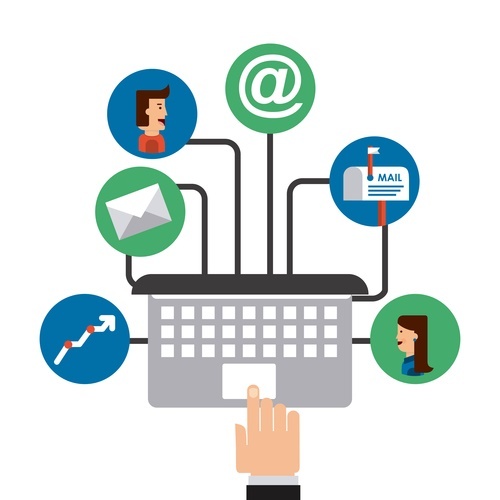 An SMS gateway also allows computers and e-mails to send and receive text messages on a large scale, making it suitable for businesses world wide. A text message gateway acts as a relay. It translates from one protocol to another through SMSCs (SMS centres). SMS centres include wireless networks that handle forwarding, routing store and other SMS gateway operations ensuring the messages are delivered to the destination mobile phone. What Does SMS Integration Mean? SMS integration is when businesses use their existing database or CRM to target their customers through an SMS Gateway service provider. This can include targeting customers with promotions, news and other information. This integration can use automation to communicate with customers at various forms of the consumer life cycle. SMS means Short Message Service while MMS means Multimedia Messaging Service. This is the next level of a text message allowing video, audio and picture content to be sent to a mobile device. Sending an MMS can lead to a premium price depending on the text message gateway used. What Is A Secure E-mail To SMS Gateway? E-mail security gateways have gained popularity as they monitor the e-mails that are processed to be sent to mobile phones. They can assist in preventing unwanted content from been delivered that can be caused by phishing attacks, SPAM and malware. Can You Send An Anonymous Text? This depends on the regulation of the country you operate in and your provider. Most countries require providers to have an opt-out functionality and ways to contact the SMS sender. Ensure you meet these requirements to remain compliant. According to the United States Trade Federal Commission, you must not use misleading or false information, and therefore must have transparency when sending bulk text messages to customers. Some SMS gateway providers in the US provide free trial periods to enable businesses to assess the functionality, reliability and efficiency of the SMS gateway. Trials can vary from 5 SMS to 25 SMS free of charge, depending on the providers offer. ClickSend, Twilio, and Burst SMS offer a free trial based on number of text messages or a set period of time. With the use of flexible SMS API, gateway providers in the United States can integrate SMS services into their systems for optimal functionality. New SMS integrations can often be added later on. Most of the providers within the SMS gateway list have an API that can send more than 100 text messages at any one time. For example, a business is able to check the balance and delivery status of a single or group of text messages without the need to login to a web interface. The official Microsoft ASP.NET Site is available for PHP, Ruby and .NET. There is no concern about shared resources as These providers have dedicated SMS API servers, therefore shared resources isn’t a concern. This allows text messages to be sent and received with efficient, reliable distribution. A majority of USA providers have quick integrations, and connected with applications such as Campaign Monitor, MailChimp, Zapier, and Infusionsoft. A US text message gateway is an online platform that provides a business with the ability to send mass text messages within seconds to a particular audience in their contact lists. A gateway platform acts as a communication channel between the user and the telecommunication network. There is both premier and hybrid telecommunication services, however the hybrid services tend to be cheaper overseas providers are known to be less efficient than those within USA. Many of the gateway USA providers such as ClickSend use highly reliable carriers, have an up-time of 99.9%, and have a 100% money back guarantee. Most American text message gateway providers have customer care centres in the USA. This enables them to respond quickly to any question or concerns surrounding the distribution of mass text messages. Providers also supply an SMS service that engages with customers and enables the ability to track and measure campaign performance. Our SMS gateway provider comparison analysis was last updated on 30 March 2019. The comparison table demonstrates the key highlights and features of the top 5 SMS gateway providers in the USA. Other SMS providers which were analysed included ClickSend MessageMedia, Twilio, Nexmo, SMS Central, Wholesale SMS, EZ Texting, and Clickatell. The information analysed on this web page was sourced from the SMS gateway provider’s web sites, however as data is subject to change, it is recommended that you verify the information with the provider. Should you find any mass text message information be incorrect, please contact us here and we will make amendments immediately. Our mission at SMS comparison is to assist American businesses is choosing the right SMS gateway provider to meet their mass text message requirements. Compare Text Message Gateway Provides Designed For American Businesses.